Hey everyone! I’ve gotten quite a bit accomplished over the past couple of weeks, so I figured I would go ahead and do another development update to share some of the more interesting things I’ve been working on. 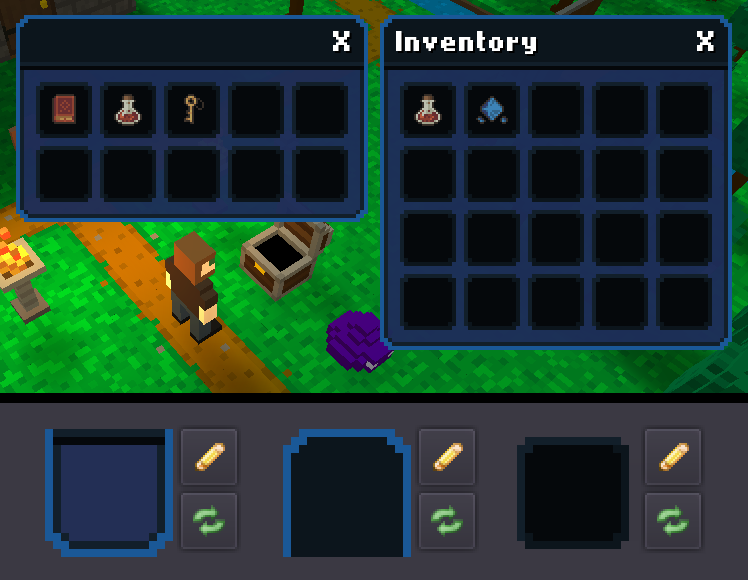 I’ve recently been polishing some of the features related to the user interface, specifically the inventory window, item container windows, and item tooltips. 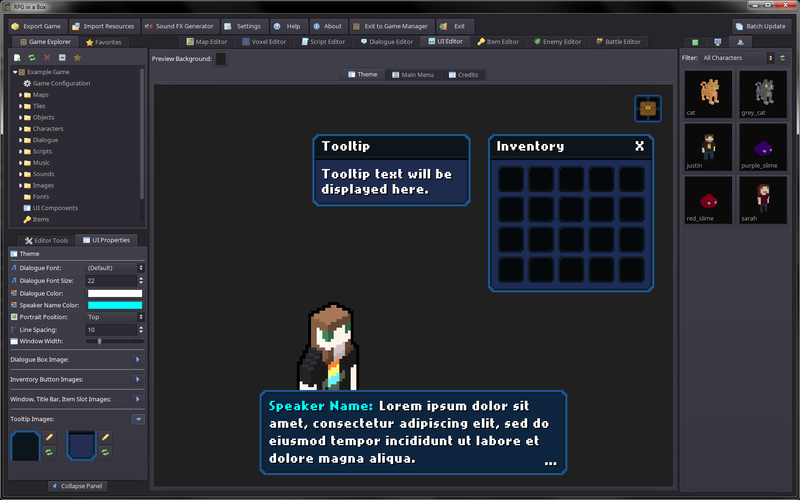 The Theme Editor now allows you to modify the appearance of the title bars, window boxes, and item slots. As shown below, these components now have a new and improved default style as well (and match the default dialogue box appearance better). For now, the title bars and tooltip text use your game’s dialogue font, but in a future release these fonts will be able to be specified individually. I also made a small tweak that will make it easier to drag windows around. Previously, you could only drag a window around by clicking on the title bar and dragging, but now you can also click on the other non-functional areas, like the borders, to drag the window. The GIF below also provides a look at the new default tooltip style! To complement these changes, I also updated the theme preview so you can see what the inventory window and tooltips look like as you make changes to their respective images. Since linking maps together can sometimes be more tedious than it should be, I added a new feature that will make it very simple to connect two maps together. As shown in the GIF on the left, you can now select a tile in one map, then select a destination tile in another map and use the “Link with Map” context menu option to automatically generate a “Load Map” quick script for both tiles. Recent updates also included some new lighting functions for adjusting an entity’s light or the map’s ambient and directional lights. In the GIF on the right, the new “Set Entity Light Color” is being triggered to fade the torch’s light to purple. To open up some new possibilities with scripting, I added the “while loop” syntax to the scripting language. I still need to test this a bit more and implement it into the visual editor, but you can use it currently within a quick script. In the GIF on the left, I’ve created a script to toggle the light 5 times using a while loop. Another addition, as shown in the GIF on the right, is the ability to retrieve an entity’s coordinate within a script for checking against another coordinate. The Main Menu Editor was updated to allow the use of an image for your Main Menu. There are also several different “image stretch modes” you can pick from to determine how the background image gets stretched (or even tiled if desired). Last but not least, I added a “Global Properties” tab to the Game Configuration dialog that will allow you to set up global values for your game in advance. This will help eliminate the need to define these in your startup script and will make them easier to access and manage. In addition to normal development and the daily documentation efforts, I have also started a bit on the migration to Godot 3.0. I will be working on that version as a separate build for now since there will be a lot of changes and testing involved, and I’d like to continue working in parallel on the current build using Godot 2.1. It will take some time to get through the conversion, but it should be worth it in the end with the new features that will be available! If you are interested in learning more about RPG in a Box, check out my Itch.io page here. And to end this update, another look at lectronice’s work-in progress cyberpunk game that he is creating with RPG in a Box!